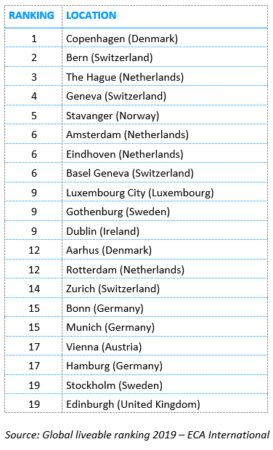 Luxembourg City is on the top ten list of the “Global liveability ranking 2019” published by ECA International, a provider of solutions and information for international human resource professionals. The study evaluates the cities across the world where it is most pleasant to live for European expatriates. It is partially based on feedback directly from expats. Its aim is to evaluate the quality of life in 480 cities all over the world. The ranking is based on criteria such as climate, the availability of health services, accommodation, social and leisure networks, infrastructure, personal security, political tension and air quality. This data is notably used by human resource professionals to calculate cost-of-living allowances for expatriates. Luxembourg shares the 9th place with Gothenburg and Dublin.